One of my favorite places on earth is the coast between Big Sur and Monterey. When we lived in the Bay Area, the Monterey/Carmel area was our go-to weekend getaway spot and we have many fond family memories from those trips. Both towns are quaint and fun, but the coastline is what we really love. It is, quite simply, breathtaking. About a month or so ago I was invited by the team at Dole Salads to visit beautiful Carmel and attend the Taste of Spain Salad Summit with a great group of bloggers. Of course I had to go! The trip was really wonderful. I had the chance to connect and re-connect with some really lovely bloggers (see list here! 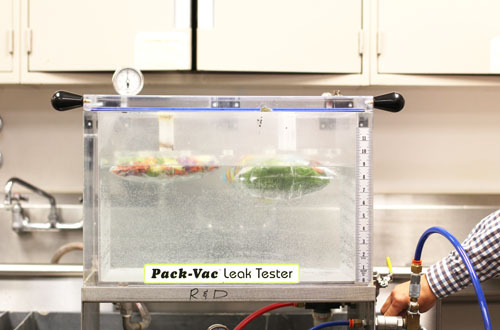 ), the Dole Salads team was wonderful to work with, and it was very interesting getting a peak into how Dole produces their food (more on that in a moment). 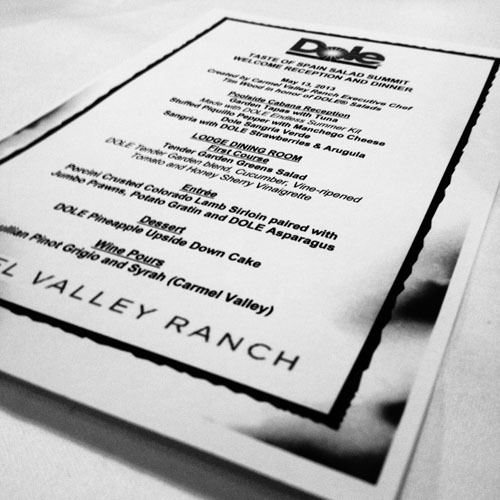 Dole put us up at the Carmel Valley Ranch hotel (which was AMAZING) and fed us an abundance of Spanish-inspired food. It was heavenly! As I often mention, I am constantly thinking about how food production and food consumption impact Mother Earth. My new year’s resolution each year is always focused on that theme. When I say I’m constantly thinking about environmental issues, I’m not exaggerating. It’s maybe kind of an obsession. Over the years we’ve modified and cut back on our meat consumption in order to make a positive environmental impact. As a result, I’m always on board with getting people to eat more fruits and vegetables, no matter where the produce comes from. Produce always requires less water and energy for production than meat does, so by eating more of those foods we are automatically using less valuable resources. But I am still also concerned about industrialized farming and the increased use of monoculture over the past few decades. The concern with monoculture is that by growing one particular crop over a large area, the plants are more susceptible to disease, which in turns necessitates the use of pesticides (bad for our bodies and the environment) or GMO plants (which are engineered to be resistent to bugs – the jury is still out on the impact of GMOs on our health and the environment). 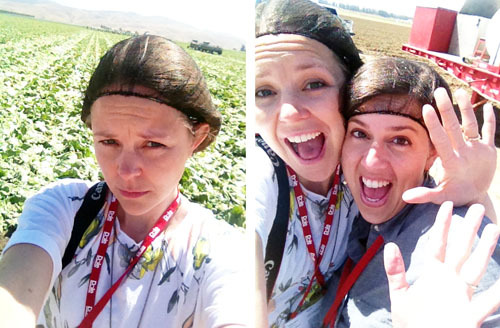 Needless to say, I was very happy that Dole invited me on the trip and I couldn’t wait to see their farms and talk with them about how Dole produces food. 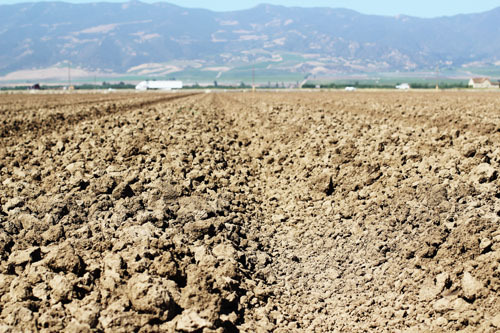 We started our day driving to the beautiful Salinas Valley, where more than 80% of our country’s salad greens are grown. First we met one of the Dole growers (a.k.a. farmers). He was kind, humble and obviously loved his job. 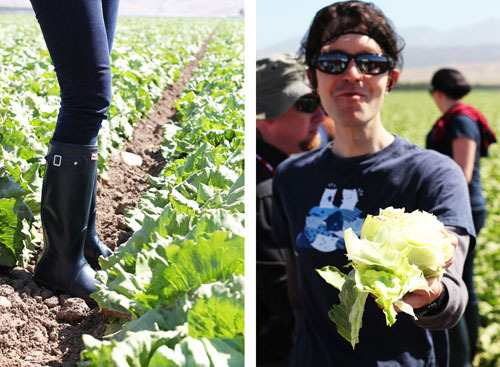 This particular farmer was growing iceberg lettuce. We learned that the crops are constantly rotated and that any food left behind during harvest is tilled back into the soil. 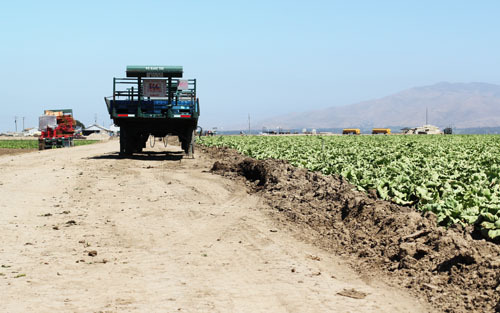 We also learned the Dole does not use GMO plants but that they do use some pesticides. When we talked with the farmer about this, he mentioned how he lives on the farm and is raising his children there, so obviously he uses as little as he possibly can. 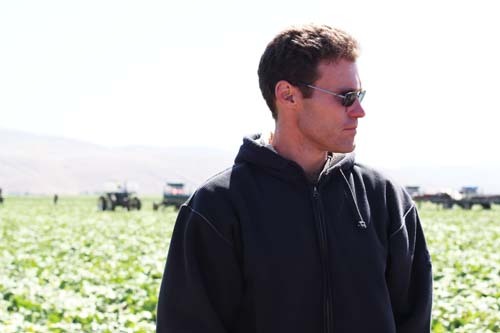 He also said that if there was more business/demand for organic, he would gladly switch to that type of farming. It was really great meeting and talking with him and seeing the passion he has for his job. 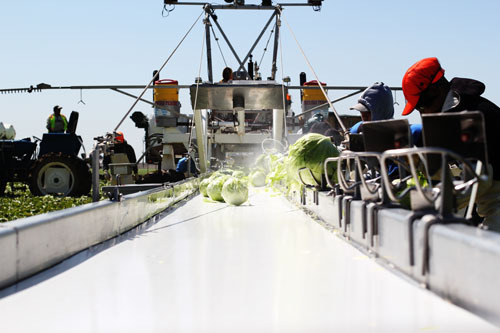 Once the lettuce reaches the packaging plant, it is washed several times (in chlorinated and non-chlorinated water), cut, and packaged in super duper high-tech packaging that is designed to keep the lettuce fresh. Safety is of the utmost importance to Dole. All along the process the food is kept safe with different rules and procedures, including hairnets for everyone at the farm! Freshness is right up there with safety. From the way the food is handled to the packaging, every effort is made to deliver tasty, good-looking food to the consumer. We asked specifically about the use of chlorinated water and were told that it is food-grade and used to keep the food safe. As a person who tries to eat produce as locally as possible and mostly organic, I must admit that the use of chlorinated water gave me pause. The thing is, there are a LOT of people to feed and we are demanding large amounts of the same types of foods, which necessitates these safety measures. I don’t think the chlorinated water used on this particular iceberg lettuce is necessarily hurting any of us on its own (and testing shows that it is safe), but I can’t help but wonder what the cumulative effect of all of the food we eat that is produced in this way has on our bodies and health, not to mention the environment. And I don’t know what the solution is. GMOs have not yet been proven to be harmful, but there are still big questions about their true impact. 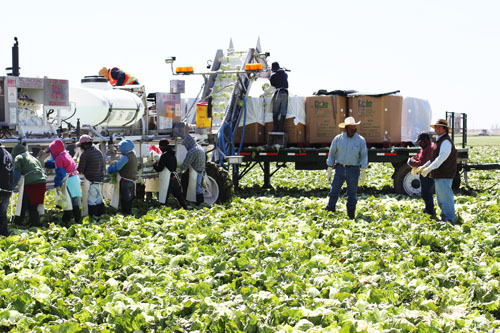 We know pesticides are no good, but if we aren’t using GMOs, we need the pesticides to produce large quantities of food. It really is a catch 22 and we just keep circling around and around. We need to feed people, that’s the bottom line. Right now, this is how it is done for the most part. 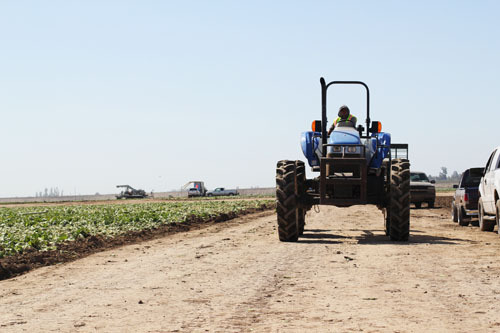 Dole tries to grow food as locally as possible. Obviously pineapples can’t be grown everywhere, but when they can, Dole does grow food as close to the place where it will be bought as possible. Yes, it’s not true local farming, but it is a start and I appreciate a large corporation making that effort. Dole also produces organic products. Let’s demand more of it so we can start to shift how our food is produced! We hold the keys to change! The trip provided a great deal of food for thought (pun intended!) for me. I’m really glad I had the chance to talk with Dole and see first-hand what they are all about. The company has a really positive vibe and I walked away from the weekend feeling good, even with the bigger questions about our food system bumping about my brain. Thank you to Dole for inviting me to attend the Taste of Spain Salad Summit. I am so happy they included me on the trip! Now, everyone go eat some salad! For Dole recipes and to enter the Taste of Spain giveaway (you could win a $40,000 trip to Spain! ), please visit www.dolesalads.com. 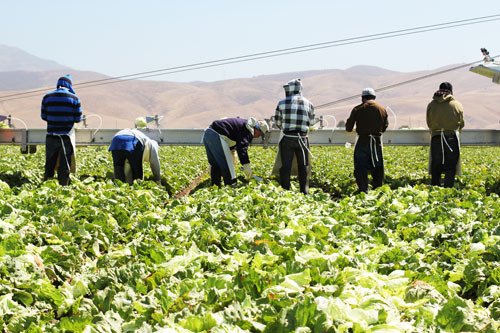 I too have been to salinas valley and woke up in the wee hours to experience the migrant workers life of picking vegetables, even if just for a few hours. How did that factor into the trip? 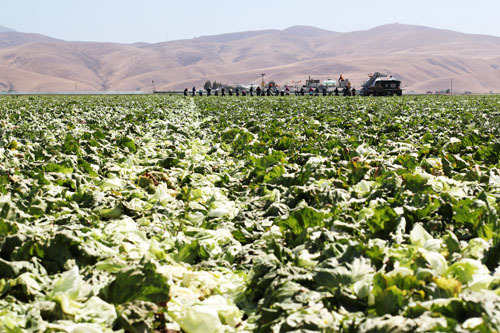 I remember walking away from that experience feeling so grateful for all the workers spending countless hours bent in the heat to pick all of the fruits and veggies I eat. People who I often forget to thank or even think about. we talked a bit about the workers, mostly about how HARD they work. I was also trying to get down to the mystery of the winter clothing out in the hot sun! blows me away every time I see that. seriously, sooooo grateful for these workers. that is HARD WORK. thank you for mentioning that aspect! Jane – It was GREAT to meet you! The Dole event was so much fun. Great post. Hope your Summer is going well. Jane- What a wonderful post. 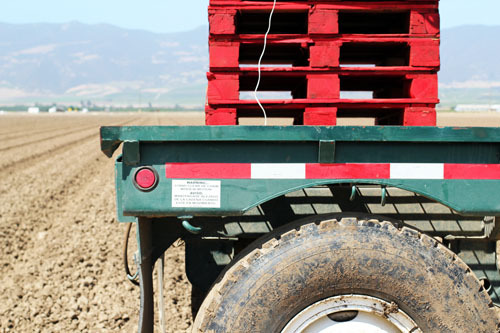 You touch on many complex issues as it relates to food production. And you are right, there are no simple answers. Everything, it seems, is a trade off of one sort. So we go with the best possible. I like the point too that if there was more demand for organic, there would be more organic. It was a pleasure to meet you!! thank you for your thoughtful comment, daniel! and the pleasure was all mine!!! I am catching up on reading this blog after being away for the past 2 weeks. This was an excellent blog post! 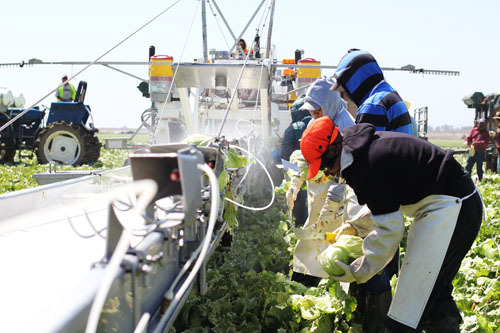 The chlorinated water and pesticides are a little troubling…but I do understand the catch 22 world we live in and appreciate learning of Dole’s safety standards. Dole does have many organic options. I particularly like their organic bananas. I originally did not buy organic bananas because bananas are on the list of most clean fruits. However, Dole puts a sticker on each organic banana cluster with a number and website address on it. You can go online and read about the farm where the bananas where grown as well as the organic and safety practices. I like this and I like that Dole seems to be a company that cares and is doing it’s best to grow organic when it can. Dole organic bananas are now a weekly staple purchase for us now. Great post. This is very interesting. I have actually always had a rather negative connotation with Dole, so it’s good to get a different perspective.